Only a few more weeks left until Sundog Arts & Entertainment Faire – my last art show for the year – so of course I’ve been working hard at completing as many new pieces as possible. Sundog is probably the largest art show in the province, and is a juried event, which makes me a little nervous. I’ve been doing conventions, art shows, and demonstrations since I was a teenager, but the lead up to every event still sends me into a bit of a panic. 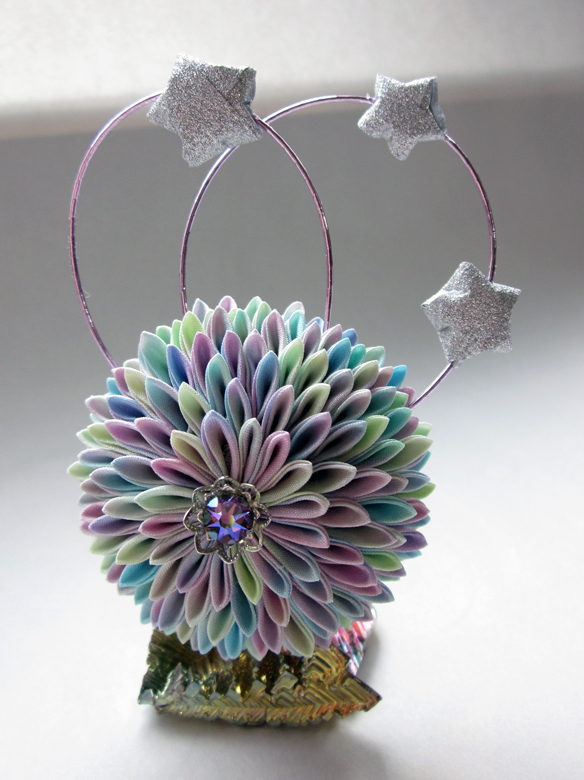 So, this week I’m excited to share with ya’ll one of my favorite pieces so far this year – a chrysanthemum made of blue, green, purple, and pink watercolor dyed petals, and featuring glittering silver origami stars. I’ve used watercolor dye technique on a few other pieces, but this piece was the reason I started experimenting with wash techniques in the first place. I was originally intending on making this for myself, but although I love how it turned out, I’m not feeling that special connection to it. I’ve had other artists tell me how there are some pieces that are just too hard to give away; they keep the original for themselves. I do have a few pieces like that, but it’s pretty rare. 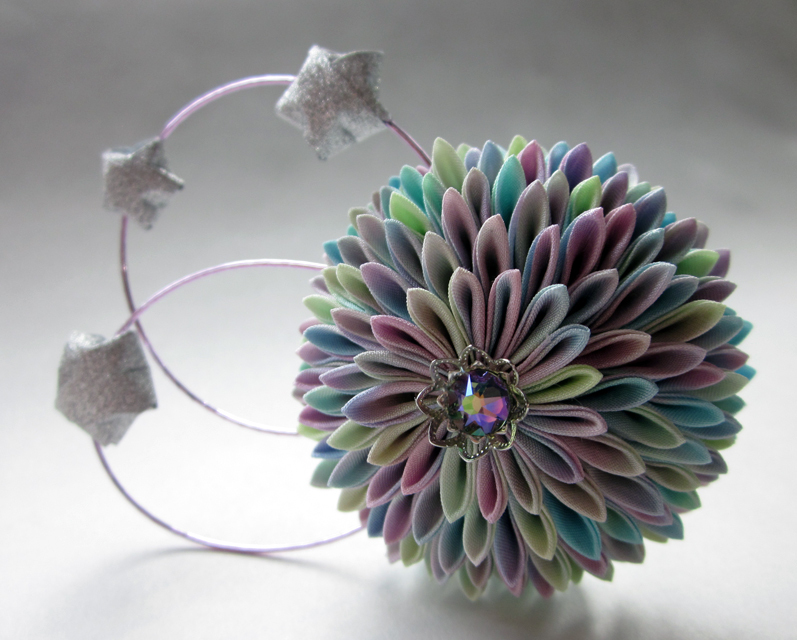 For me, unless I’m creating a piece of art for a particular purpose, the act of creation is enough – and space is limited. If I can find the piece a new home, then I’m happy to do so. This is one of those situations. 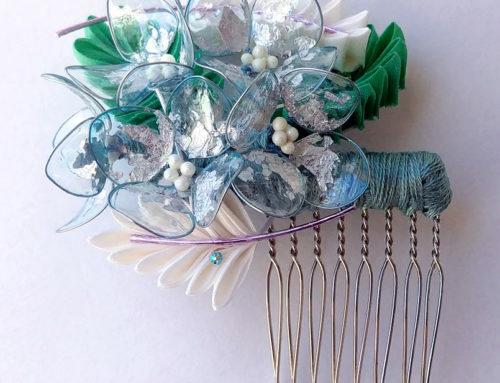 I’d started out making this piece to match with one of my kimono, but now that I can see them together I don’t think it works as well as I’d hoped. I’ll have to come up with another idea and try again. 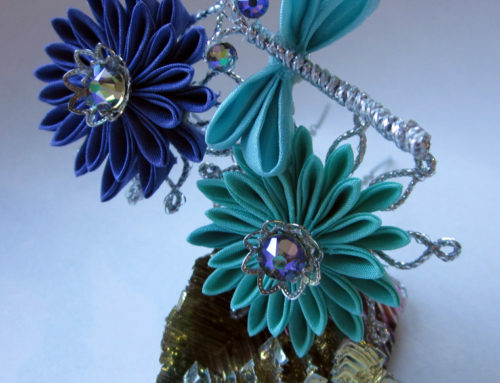 Hopefully, that just means someone else will take this kanzashi home and give her the love she deserves. 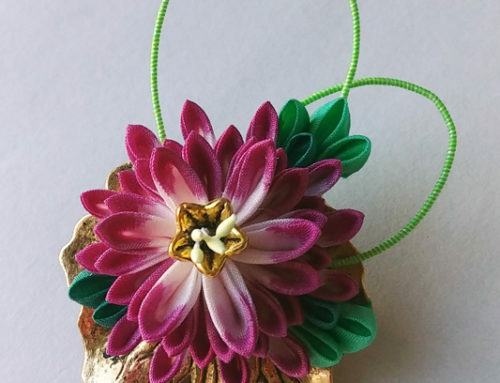 I do collect kanzashi, which I enjoy sharing at my presentations, reference when I am working on my own kanzashi, and display in my home. 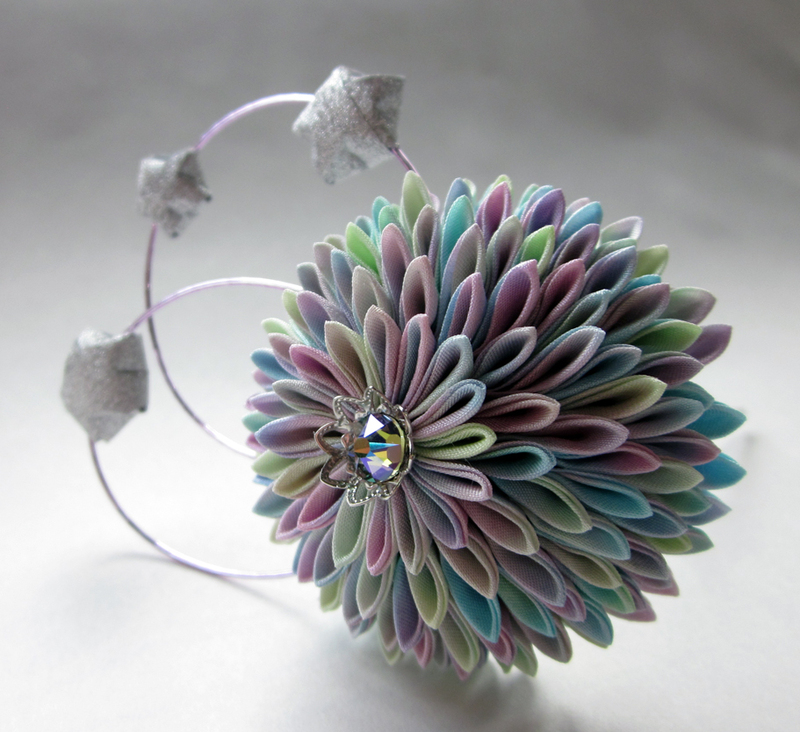 But, I think it’s the hope of every kanzashi artist that their work is actually worn. That’s certainly what I hope for when people purchase from me. 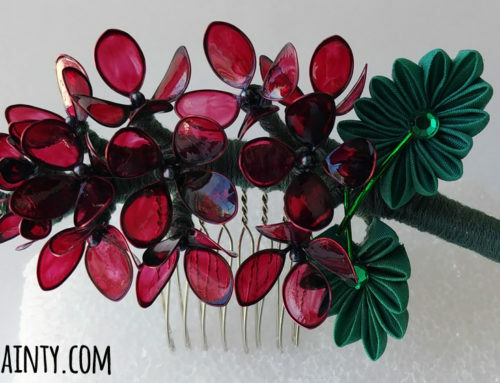 That’s the point of a hair accessory, after all! 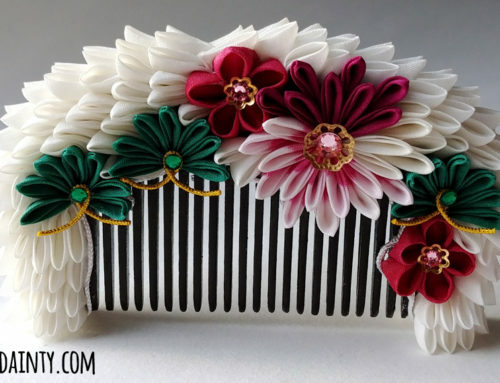 I hope you’re not all getting bored of these kanzashi posts, but Christmas is coming up soon, and now that husband and I have (finally) moved into our house, I’ll be sharing some house-related projects, and some Christmas gifts I’ve been working at on and off in between everything else. New dragons, sculptural work, and furniture refurbishments abound! Having our own home to renovate and decorate has been a real learning experience for both of us, and I’m excited to share all the ways we’ve been personalizing our space with you. Anyhoo, that is all I’ve got to share with ya’ll this week. I hope you check back in again next week for new art, crafts, or cookery – and stay safe out there!